What a powerful statement! 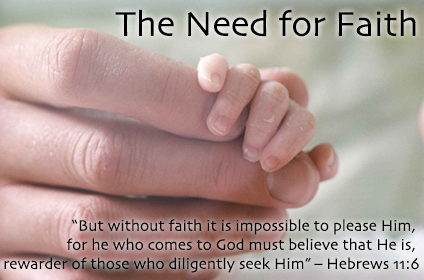 Man cannot please God without faith. Yet, the need of man (whether he knows it or not) is to please the Creator. Simply put, God has ordained that the means of His grace is faith. We are all familiar with Ephesians 2:8 which says, “For by grace you have been saved through faith, and that not of yourselves; it is the gift of God”. Certainly, we are saved “by grace through faith”. So, the means of God’s grace is faith. He has chosen to extend His grace through faith. Faith must have object. There is no such thing as blind faith. There is no such thing as faith in nothing. Even the atheist has faith, though he may deny it. He has faith that all of the uniformity we see…all of this grand design…is just some big cosmic accident. He has faith that every scientific law that we find is the result of chance. Oh, what faith! Yet, it is faith. He doesn’t believe in nothing. He believes in chance. Our faith has an object as well. But, the object of our faith is real and true. In fact, Galatians 3:26 says, “For you are all sons of God through faith in Christ Jesus”. The object of our faith is Jesus Christ! We trust and know that God’s great design of salvation is to save sinners through the sacrificial and substitutionary sacrifice of His Son. We trust that He died for us! This is not random, as the atheist believes. This is the perfect plan of the all wise God. Paul informs us in Romans 3:21-23, “But now the righteousness of God apart from the law is revealed, being witnessed by the Law and the Prophets, even the righteousness of God, through faith in Jesus Christ, to all and on allwho believe. For there is no difference; for all have sinned and fall short of the glory of God”. If we, as sinners, are to be declared righteous before God, it must be “through faith in Jesus Christ”. There is no other way. Just a few verses later, Paul even declares that we are “justified by faith” in Christ (Romans 5:1). Certainly, this is man’s need! This is how man can please God, as our text verse declares. But sadly, all men do not have faith (2 Thessalonians 3:2). In fact, nobody in their natural state has faith for “the natural man does not receive the things of the Spirit of God, for they are foolishness to him; nor can he know them, because they are spiritually discerned” (1 Corinthians 2:14). Paul said, “…we preach Christ crucified [the Gospel], to the Jews a stumbling block and to the Greeksfoolishness, but to those who are called, both Jews and Greeks, Christ the power of God and the wisdom of God” (1 Corinthians 1:23-24). When God empowers the Gospel, it changes lives (1 Thessalonians 1:4-5; 2 Thessalonians 2:14). So, faith is a gift of God (Ephesians 2:8). There is no greater gift than the gift of faith. Certainly, God requires “repentance toward God and faith toward our Lord Jesus Christ” (Acts 20:21). And yet, we are condemned because we do not naturally possess saving faith. “But God”…did you get that? “But God, who is rich in mercy, because of His great love with which He loved us, even when we were dead in trespasses, made us alive together with Christ (by grace you have been saved)”(Ephesians 2:4-5). God graciously calls us by His grace in regeneration as His Spirit grants us both repentance and faith in Christ through the Gospel (1 Corinthians 15:1-2). Child of God, take a moment and thank God for this wonderful gift of faith that He has given to you this day! Watering the Tulipsis brought to you by Sovereign Grace Baptist Church in Northport, AL. For more information, please visit www.sovereigngrace.net. “Your app to the Gospel” is available in the iTunes app store as well as Google Play for Android devices. Please download it today!